That Vintage cracked its own egg in the warm month of February 2008 and fell into the hands of Sophie Hill, a Launceston based bird-obsessive artist and lover of all things handmade. That Vintage pieces are created using the beautiful Tasmanian Myrtle timber. It began with a Tasmanian Blue Wren and a Common Sparrow, dancing together in the warm sunlight of an early Summer morning - from this friendship, the illustrations were hatched and then turned into wearable pieces of artwork - a tribute to the diversity of friendship. In Sophie's nest of inspiration you will find cups of tea, synth folk music on repeat, a menagerie made of porcelain and her fair share of fabric swatches. The view from Sophie's nest is a Native Australian garden, growing with the hopes that the Bottle Brush and Kangaroo Paw will evoke new feathery friendships. 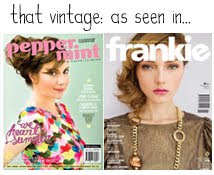 That Vintage designs are made with love and really, that is all that's needed.